"I am Nujood, Age 10 and Divorced"
There is a group here in town called Riggity Jig. 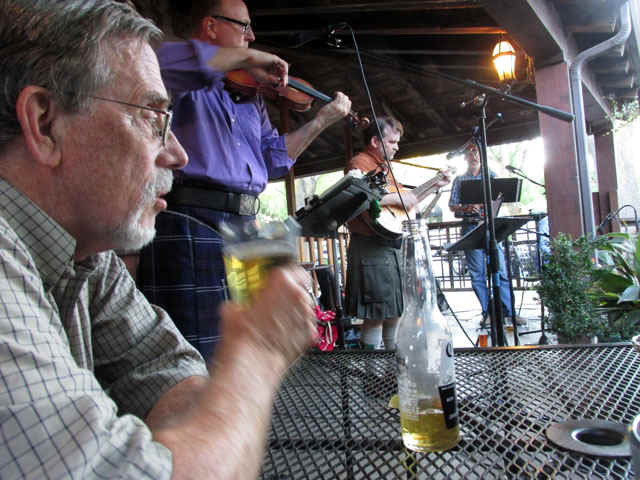 A group of five guys who play traditional Irish and Scottish tunes around town. As they describe their music, "perfect for weddings, wakes, bar/bat mitzvahs and any other time when you want some fun music!" But in two days, Little Prague is going to close and so tonight, Riggity Jig's held its last performance there, though they are still available for wakes and bar mitzvahs and other events! Haggis in a Czech restaurant. Whoda thunk? I didn't have any Haggis, of course, but there was the traditional procession and then all who wanted to partake did (Walt did). I was there for the music. It's my roots. 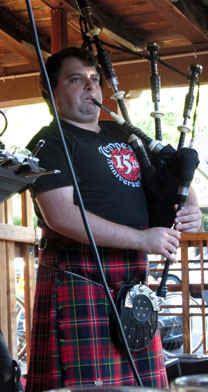 How can you not be happy listening to a bagpipe (Yeah, yeah, I know a lot of people hate them, but I love them. It's the Scot in me.) There used to be a piper who lived somewhere in our neighborhood and who would practice outside every night around dusk. I was always sorry when he moved. 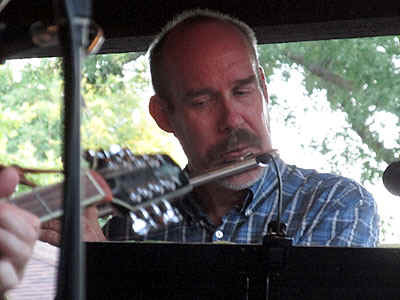 We started going to hear Riggity Jig because of our friend Lee Riggs, who plays the flute and the tin whistle. Lee's brother, David is the group's manager and also plays the fiddle. The group invited everyone to come join them for one last Czech-style c�ilidh. We had a wonderful time. Walt dropped me off and I tried to find a table, but everything was taken. I then saw a table right in front of the band where only one woman was sitting. I thought she looked familiar and asked if I might join here and would there be room for Walt too. It honestly was the best seat in the house and she was so gracious. Her name was Mary and no, we had not met or even seen each other before, but we shared bread and clapped together for the many tunes. You could not have asked for a more perfect night, weather-wise. It was warmish, but with a cool breeze blowing. Absolutely perfect. It was a real nostalgia evening for me. So many memories! When I worked for The Typing Company in the 1980s, what is now Little Prague was a place called The Blue Mango and our office was right next door. The Blue Mango was kind of a hippie place that was owned by the workers and served vegetarian food. What I remember most are the great desserts. My boss would go over to the Blue Mango once a week and buy these amazing brownies that she would give to the three of us who worked for her (one of whom was my dentist Cindy, who was working at the Typing Company while getting her dental practice established). At that time, I was also doing cake decorating out of my house. Before me, the only place to get a cake in Davis was at the supermarket bakery and everybody liked my cakes better, so I had a thriving business for a couple of years, violating more health regulations than I knew existed, but I never even thought about that. I was just baking cakes for friends, who happened to pay me. My friend Sue decided to open a bakery, called The Farmer's Wife. I was her first cake decorator, and thrilled to have a professional work environment and, frankly, happy to be giving up my home business. I worked for Sue until she could find a "real" cake decorator and then I hung up my frosting bag and retired. After Sue was in business for awhile, and I lost touch with her, suddenly I read that she was joining Little Prague. She was closing her bakery, and moving The Farmer's Wife to Little Prague. She continued to sell those wonderful cakes and pastries under her business's. I don't know when the restaurant took over. 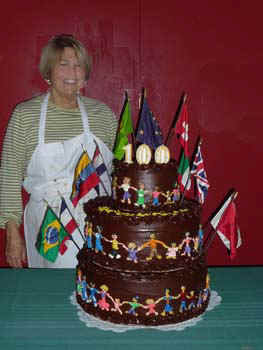 In 2010, Sue called me and asked if I'd like to help her decorate a cake for Dr. Herbert Bauer, who was turning 100. Dr. Bauer was a well known physician whom everyone loved. He was often called "The conscience of Davis" for his many letters to the editor on the topics of the day. There was going to be a city-wide celebration. 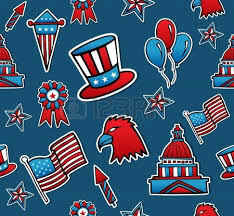 We would make this wonderful cake with as many people holding hands decorating the edges of it, and flags of the various countries for which he had done work. We got together in the kitchen of Little Prague and put together this gorgeous cake. It was fun working with Sue again. We hadn't seen each other in years -- and I hadn't decorated a cake in years. But we made our little people and dressed each one different. The nicest thing about that cake was that I didn't have to transport it. Sue took it from Little Prague to the Art Center, where the birthday party was to be held. If it fell (it didn't), it wouldn't be my fault! 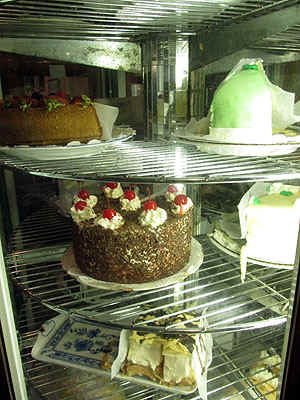 Tonight I wandered back toward the kitchen and saw the few cakes that were still available. Little Prague is not stocking things...in fact, they were almost out of beer tonight! I never buy dessert, but I had to order a piece of Black Forest cake, just for old times sake, for my cake decorating business, for The Farmer's Wife, for Sue, for Herbert, for wonderful memories...and the cake itself was tasty too. The concert tonight ended with the piper playing "Aulde Lang Syne" and, predicting that was going to happen, I was able to catch the video on my cell phone, which, if you are on Facebook, you should be able to see here (but if you aren't on Facebook, you probably won't be able to see it). It was an absolutely lovely evening. I don't know what is going to happen to Little Prague, but I hear there is going to be a Blue Mango nostalgia get together after it closes. I think I'll miss that one, though. Day 12 -- Happiness is a nice beer, a perfect weather night, and great music.